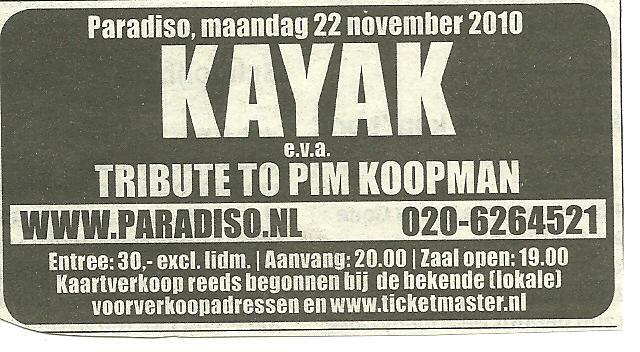 On a cold evening in november 2010, the famous Paradiso in Amsterdam hosted the Pim Koopman Tribute Concert by "Kayak and Guests". A good crowd had turned up to pay tribute to Pim and to his music. Good for the band, and especially for Cindy who -with her partner Patrick- was largely responsable for organising the concert. It goes without saying that it was a difficult night for the band. Especially Edward and Cindy could not hide their emotions all the time (as if they wanted to). But Also Rob Vunderink -not losing his dry humour- was touched by it all. One of the most difficult tasks was reserved for Hans Eijkenaar. One of Holland's best drummers (and admired by Pim), he was invited to occupy the drum stool. And he did that in a perfect way! After the break, the band (plus keyboardist Hans Voerman) was introduced by Leo Blokhuis, the unofficial Dutch 'pop professor'. From the balcony of the Paradiso, he spoke about Pim and introduced the guests of the night. For more info about Pim's work with some of the guest artists, please visit my weblog "Kayak Projects". For now, let me say that Pim has worked with so many artists as a producer, writer or musician, and that much of his work was a far cry from Kayak. But all guests received a warm welcome from the Kayak fans, and they all did a very good job! First of all, there was Pussycat. Or at least: lead singers Toni Willé and her sister Marianne, doing "Teenage Queenie". The next artist was Alides Hidding, of Time Bandits fame. His funky "I'm Specialized In You" was the first song to 'swing away' the rather serious mood of the first half. Okkie Huysdens, Pim's partner in The President, worked his way through their hit "You're Gonna Like It". Then it was time for Caren from Maywood to climb the stage. With her uptempo "Rio", she kept up the joyful spirit. José Hoebee (artist's name just José) did a rendition of her hit "I Will Follow Him", which kept up the good spirit on stage and in the audience. A true highlight was the contribution of Michael Robinson. Pim Koopman not only produced a couple of records for this Irish/Dutch singer, but the two were also close friends. Robinson is not a very wellknown artist, so many of the fans didn't know what to expect. 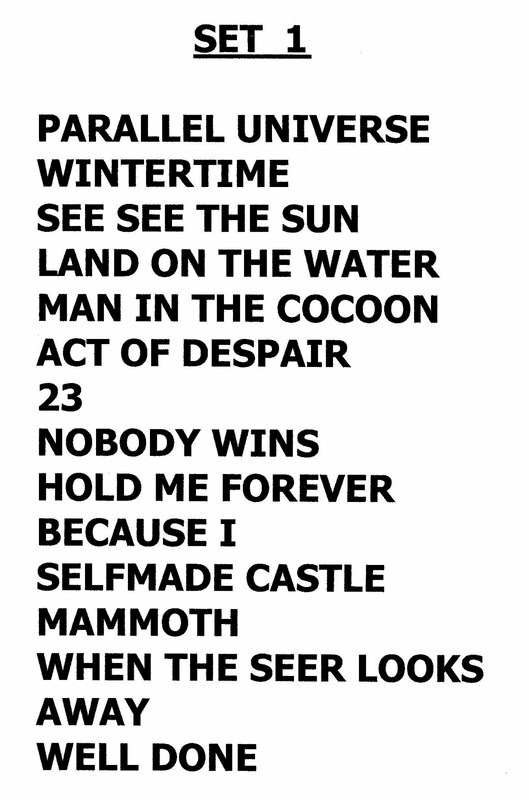 But with just his voice, his guitar and his own tribute song "Friend" he got the entire Paradiso absolutely silent for 4 minutes (followed by a long ovation). Very well done indeed, Mr. Robinson!!! Then, it was time for a small reunion of Diesel , a band that featured Pim and Rob Vunderink (amongst others). Singer Jeroen Englebert, who also used to form a 'songwriting team' with Pim, gave us a great "Samantha" and (together with Rob) of course a rendition of Diesel's big international hit "Sausalito Summernight". The afterparty in the basement was a bonus... again: many tears of joy and sadness, hugs, kisses etc. It was good to see many ex-Kayak members walking around: ex-bassists Cees van Leeuwen, Bert Veldkamp and Peter Scherpenzeel were there. 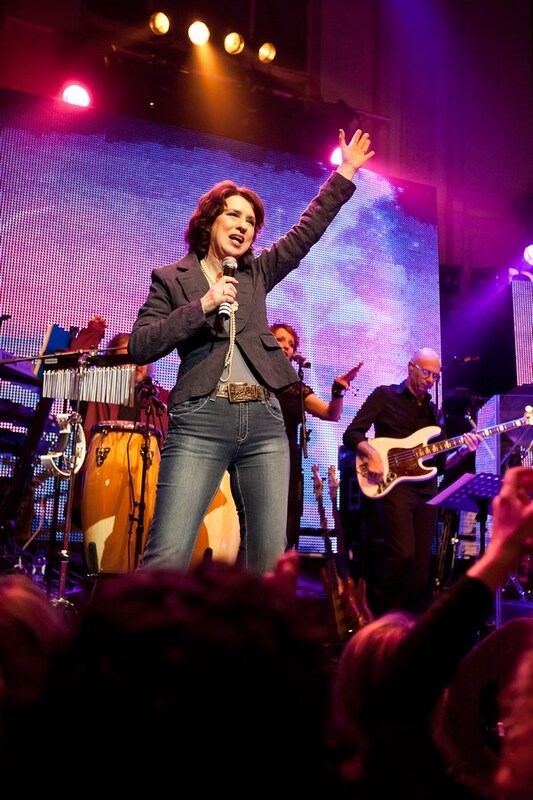 But also Peter's wife Katherine (ex-backing vocalist), guitarist Rob Winter, and 'Nostradamus'-members Marjolein Teepen and Marc Dollevoet. Other 'celebrities': ex-minister (and huge fan) André Rouvoet, Chiel van Praag (who was a member of High Tide Formation), Hans van Hemert (producer of Kayak's first demo recordings), and members of Syb van der Ploeg's band "De Kast".